Editor’s note: The Daily Illini sports desk sits down Sunday nights and decides which Illinois athlete or coach is our Illini of the Week. Athletes and coaches are evaluated by individual performance and contribution to team success. It starts with a few steps, and then a little hurdle jump for her three-second dash down the runway. A jump off the springboard leads to a front handspring onto the vault table. For extra lift, she pushes off the table with both hands as she ascends before doing a front tuck. A full twist later, she has righted herself and landed. Her feet and the mat are one. It’s a stuck landing. Gymnastics performances are hardly ever worthy of perfection, but Amber See’s vault Friday at the State of Illinois Classic in Normal, Ill., was a completely different story. Her teammates, her coaches, the crowd and, most importantly, the judges witnessed a rarity, a perfect 10. See was fourth in the vault lineup that night. Sophomore Heather Foley started the event with a 9.800. That score was matched by senior Sarah Fiedler. Up next was freshman Emily Lennon, who set a new career-high score of 9.900. The routines prior to See’s produced high scores, especially for an Illinois team that struggles on vault. See was aware her chances of scoring high were good, as judges generally tend to score higher as the lineup continues. Nonetheless, the pressure was on her to perform well. See’s mental preparation worked. The vault was flawless. She stuck the landing, an area where judges tend to make deductions, so she was aware she had a shot at a perfect 10. It was in the judges’ hands, though. They control the gymnasts’ fates, so she wouldn’t know for sure until the scores were in. Her vault scored a perfect 10. The goal she had set as a freshman had been fulfilled. She was thrilled, but her accomplishment wasn’t just for herself. It was for her team. 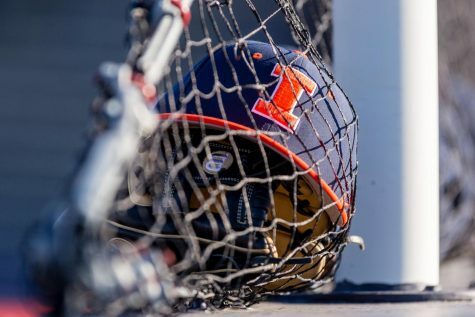 It was for Illinois, but it’s because it was for her school that the excitement had to be ceased immediately because two of her teammates had yet to go — freshman Erin Buchanan and sophomore Giana O’Connor. It’s easy to get caught up in the excitement and lose focus in the wake of a teammate pulling a perfect score. In fact, O’Connor became so invested in the moment that she forgot she had yet to perform her vault. Buchanan and O’Connor were able to excel, despite the outburst of joy. They scored 9.900 and 9.850, respectively. With those scores, the team secured the highest vault score in program history, a 49.425. See is just the third gymnast in program history to record a perfect 10 on an event. Coincidentally, the last one came during last year’s State of Illinois Classic. It was also on vault and also came from a senior, Alina Weinstein. See hadn’t realized she had matched her former teammate in the same routine at the same event until someone told her. One major difference between See and Weinstein’s flawless vaults, though, is their direction. Weinstein, like the majority of gymnasts, goes into her vault backwards. That kind of approach is also generally perceived as easier, opposed to front-facing vaults like See’s. But See has always done it that way throughout her gymnastics career. The vault title at the Classic is her fourth one of the season, half of the eight possible so far this season. Her unique vault has helped her achieve success not just in regular season meets, but at Big Ten Championships as well. As a freshman, See tied Penn State’s Sharaya Musser for the vault title with a 9.900. See’s accomplishments, however, wouldn’t hold the same meaning if she didn’t have people to share it with. Freshman Mary Jane Horth said the team “basically started crying” for See and the perfect 10 she received. It’s those kind of things See really takes from the glory.